We open the oven to take a peek at the golden pies. The smell of melted butter wafts through the kitchen. The timer finally goes off: the most quintessential and classic American dessert would soon be critiqued by us both. Since there’s nothing better than crispy, flaky crust with sweet, warm, and gooey apple filling, we set out to find the best apple pie in Holland. Throughout our search, we kept a few aspects of apple pie in mind when tasting. The crust should be crispy on the outside with a squishy inside. The filling should be fairly sweet, but not overpowering. And most importantly, the filling needs a good blend of spices. To keep consistency, we made a rubric to rate each pie in four categories: crust, filling, overall taste, and appearance. The scale for each category was 1-10 with a score of 5 being average. We declared the pie with the highest total score as the winner. Our first look at the Russ’ pie was underwhelming due to the lack of visual appeal. The poor impression carried on after tasting the crust and filling; it was just average. The crust was flaky but a little burnt; however, the main downfall of the Russ’ pie was the filling. Although the pie had the smell of cinnamon and nutmeg, the actual taste lacked spices and was overly sweet. Also, the apples were a little too crunchy. We gave the pie a 5; while not the worst pie in Holland, it was far from the best. While the McDonald’s pie was the cheapest, there is no doubt that its pie was the most disappointing. The filling was bland, and the crust seemed to be undercooked and squishy. To put it simply, this pie was the worst in almost every category. The only category McDonald’s pie scored over 5 in was appearance. We thought a score of 7 would suit its appearance because of the unconventional rectangular shape. The combined taste of crust and filling was dull. The crust didn’t provide much texture, and the filling had only a sweet flavor that lacked the depth that comes with spices. The only upside of the pie was how thick the filling was. With everything said, McDonald’s had the worst apple pie on our list. This pie scored a 3 overall which easily puts this pie in last place. The Target pie’s appearance was by far the best out of all the pies we sampled. 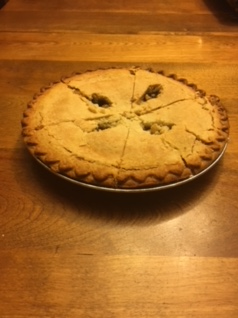 A lattice-style crust was enough to get an 8 in the appearance category. The pie itself had a thick gooey filling, thicker than the other pies we tried. The crust not only looked impressive but tasted impressive. Target’s pie had the right amount of crispness and flakiness on the outer layer with a softer inner layer. Although the filling was a decent thickness, it still lacked the balance of spice to sweet we were looking for. As a whole, the Target pie tasted much better than we expected. We were a bit surprised how well the crust complemented the filling, but the lack of spices in the filling brought our excitement back down. 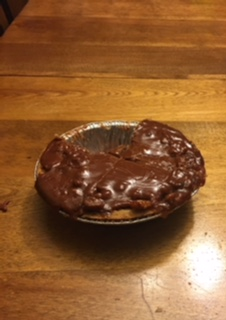 The appearance of the Target pie ultimately carried it to the third place spot. The Meijer pie was the unique pie we tried. The pie was topped with a heavy caramel cream frosting, which looked worthy enough to earn an 8/10 in the appearance category. The topping was no doubt the highlight of this pie, but the rest was still enjoyable. There were hints of spices such as cinnamon, but crunchy apples ended up spoiling the overall texture and taste of the filling. The crust was average: too crumbly and lacking the light flaky texture we were looking. In all, the caramel topping was impressive and lifted the taste and appearance scores to 7 and 8 respectively. 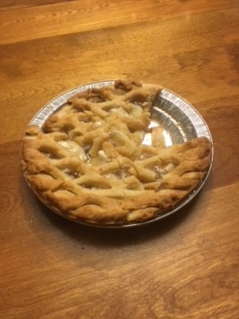 If not for the mediocre crust and the crunchy apples, the Meijer pie would most likely have challenged for the number one spot. Without a doubt, the Crane’s pie is the most exceptional pie in Holland. The filling had exactly the right ratio of sweet to spice. The hints of cinnamon and nutmeg elevated the filling to the highest score. Even with the spices, there was still a heavy sweet taste. With that being said, the Crane’s pie had an astonishing taste. The first taste was filled with a crumbly yet flaky crust. Then the powerful sweetness of the pie sets in, and the spices start to emerge to balance the flavors. 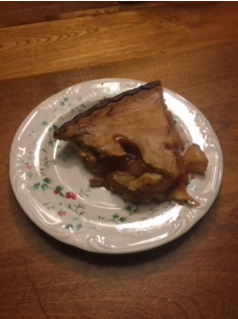 Although we didn’t love the appearance, the proportion of sweet to spice majorly enhanced the taste of the pie and made up for the lack of presentation. The pie earned straight eights in every category except appearance. For us, appearance was the lowest priority on the rubric. So the Crane’s pie, even with an unimpressive appearance, still scored high enough on taste to lift itself to our top spot.